So far in our EAGLE tutorial series we discussed about the software environment and the schematic editor. 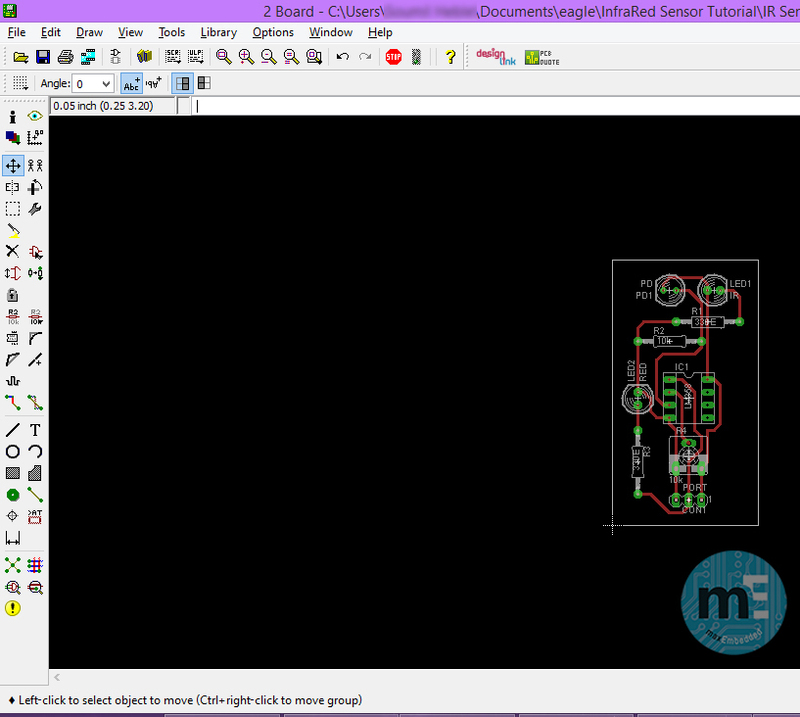 Next in line is how to create a board layout from the schematic we just created using the layout editor. 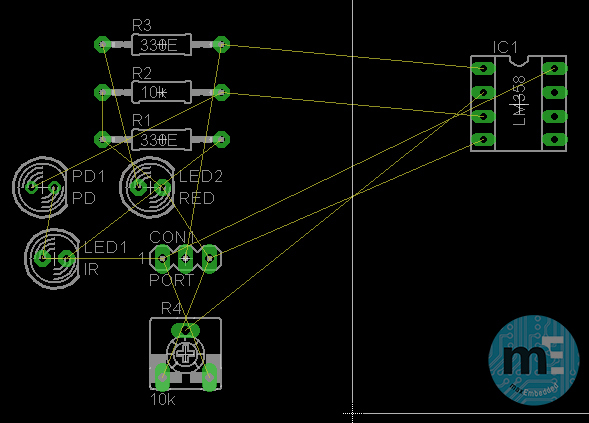 This is a relatively simple step since EAGLE links your layout file and the schematic file together and automatically includes the components in the board layout. Your task is to arrange them on the board appropriately, route the traces (make electrical connections) and add text/image on the board if you want. And if you use the EAGLE’s autorouter feature, all you need to do is to make it look pretty! Even though it might sound simple, it actually isn’t! For simple circuits, that’s fine, but as the complexity of the circuit increases, and as the number of layers in your PCB increases, the layout becomes more and more mind-boggling and will require your complete attention! There are some design principles and specifications one needs to keep in mind as well which is out of the scope of this post and will be posted separately. This post simply deals with the various tools that EAGLE has to offer. 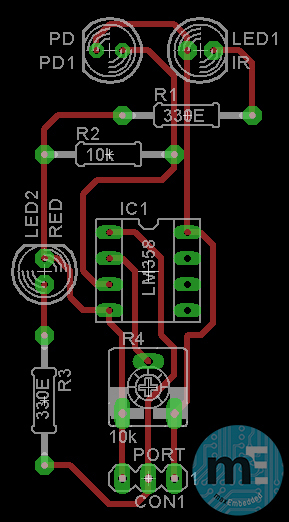 Since we are using the free version of the EAGLE software we are going to design a single layer board. We are also going to connect the components manually without using the auto-router. Autorouter is a feature of EAGLE where the software creates the traces connecting the components automatically. 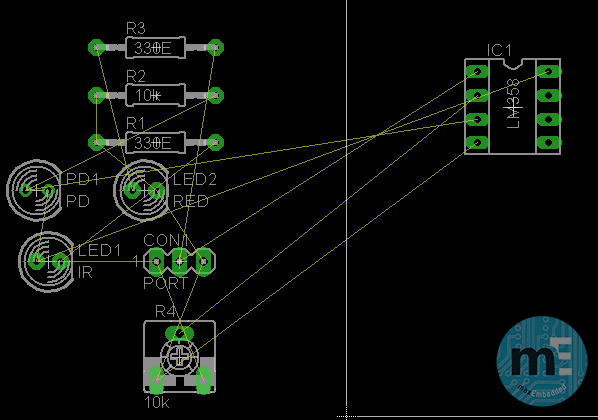 The board layout from the schematic is just a click away. Simply click the board button in the menu bar of the schematic layout editor as shown below. The layout editor’s workspace is quite similar to the schematic editor’s workspace like the grid, command line, etc. This saves us from discussing the same concepts again. Only the new and required tools and areas are explained. Board dimension is the actual size of the board which is the big white rectangle visible in the black editor space. Anything outside it will not be produced or included in the board layout. You can change the dimension by using the move tool. When you transit from the schematic to the layout editor all your components are automatically placed by the software outside the board. You can see it on the bottom left in the above image. It is zoomed in to explain further. 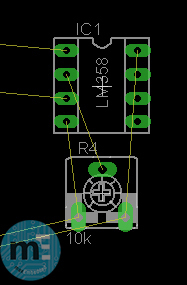 In the zoomed in image you can see the component package design like the Dual In-line Package of the op-amp. The yellow lines, called the “air wires”, represent the connection between the components that you defined in the schematic. They are not actual connections and are for the designer’s reference only so that the components can be arranged as compact as possible in order to get a smaller board size. Route: The route tool is used to draw traces in between the components. A trace is an electrical connection on a PCB. They are the lines that you usually see on a finished PCB. Rip-Up: Made a mistake while using the route tool? The rip-up tool is here to your rescue! Use it to undo the trace connections you made. Via: Via is a board component which is used to connect different layers of the board or it is used as a jumper to cross over trace connections. Ratsnest: When you place components on the board and rearrange them differently, the air-wire connections still remain the same. This tool is used to calculate the shortest air-wire distances. It is usually customary to use this tool every time you move a component. Holes: This tool is used to place drill marks on your PCB. Design Rule Check: Your board manufacturer may have certain limitations on the board design such as minimum trace width, minimum clearance etc. You can define these in the tool and check your board whether your board design is violating these rules and make corresponding changes in design. Let’s begin designing the board! Start by moving the components from outside the board dimension (using move and rotate tool) to the inside one by one. 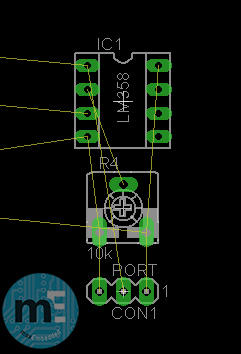 Usually start by moving the component having most number of connections, in this case the op-amp. The first image is the one where the component is moved into the board dimension and the second one is after doing the ratsnest. The change in air wires is small but it makes a large difference as you place more and more components inside the board. 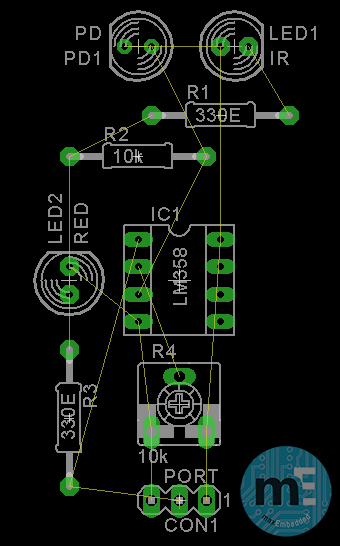 Now start by moving and arranging the components in decreasing order of connections (in this case, op-amp, potentiometer, male header, IR LED, 330E resistor, photodiode, 10k resistor, red LED, 330E resistor) and follow each move with ratsnest. The above picture is the image of complete arrangement of the components on the board with minimum entanglement of the air wires. 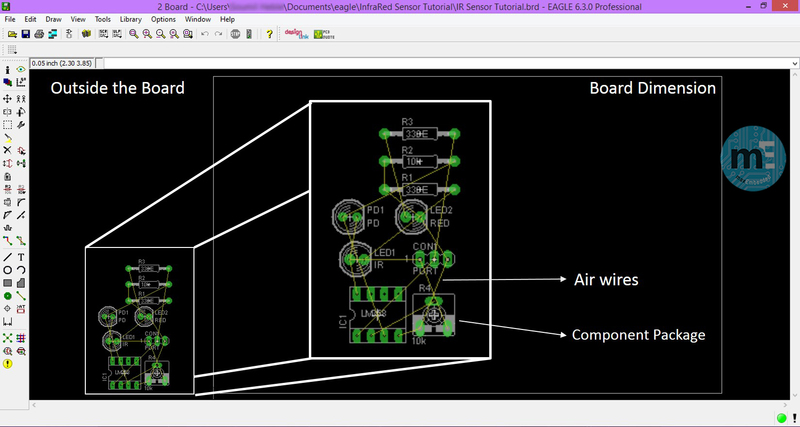 The next step is to connect the components using the route tool. When you click on the route tool, a special settings menu will appear below the menu bar with some options. The “16 Bottom” defines the current layer where you will be routing, since we are going to design a single layer board we will change it to “1 Top”, the top layer with red color. As mentioned earlier, EAGLE supports up to 16 layers of design. Just to give you an idea of how much that, modern day smartphones’ circuit board contain up to 16 layers and modern day computers’ motherboard contain up to 12 layers! Physically the two layers are put together by non-conducting adhesive and vias are used to create electrical connection between them. You can also see some shapes like right angle, obtuse bend, squiggly lines, etc. All these specify the type of turn your trace will make when you will be routing. Right angle is usually not used, mostly the angled ones are used. This is because we want to keep trace width as uniform as possible. Varying trace widths may induce lag in the transmission of signal which may affect the functioning of circuits, especially the circuits with fast clocks. Tip: While routing you can change the bend type either by clicking on the icons or use right click to cycle through the options. Next is the width option. This specifies the width of the trace. Width of the trace should be directly proportional to the amount of current it has to carry. Greater the current, greater the width of the trace. If you use a trace thinner than the amount of current it is supposed to carry, the trace will heat up and eventually burn out and break the connection. Trace width also depends upon the material of the trace itself, but lets not worry about that now. The dimension of the width is in inches or mils (1 mil = 1/1000 of an inch, the standard used in PCB designing). A trace width of about 30 mils (0.030 inches) is sufficient for manual etching of boards. The above image shows the completed routing. Using the group tool select all the components and traces, now select the move tool and right click on the selection while holding the Ctrl key and move the whole circuit to the bottom left near the origin (inside the board dimension). Congratulations! Your board is now ready for manufacturing! If you are getting it manufactured online or through some industry, you’ll need to provide gerber files. Gerber files are PDFs of the PCB. They describe the PCB exactly as it should get into production. They are not supposed to be edited. We’ll learn how to create gerber file in our upcoming post. That’s it for now! Subscribe and stay tuned! Excellent, I will study this in my spare time as I have wanted to learn Eagle.